Malaysia have an abundance of great diving spots for amateurs! With calm, clear waters and great marine life for you to explore, we’ve compiled a list of the 7 best diving spots you should go to if you’re just getting started in diving. Located on the east coast of Peninsular Malaysia within the Terengganu Marine Park, it offers a diversity of marine life that include 80% of the species found in the ‘coral triangle’ with amazing dive conditions. It offers coral gardens, beach dives and even a bookable discovery dive (perfect for beginners!). There are more than 20 sites to visit that include wall dives, coral reef dives, macro diving across sandy areas. Some things to note are marine fees apply for entry into the island and the island cannot be visited between October and March because of the monsoon season. Located between Redang and Perhentian, this smaller island offers sandy white beaches and clear blue waters with an abundance of marine life and coral. Some of the more popular dive sites are Terumbu Kuning, Karang Nibong and the House Reefs. There are also some bays for night diving! Some things to note are Lang Tenggah cannot be visited between October and March due to monsoon season. The big island is located at the east coast of Peninsular Malaysia and is one of the most popular diving locations. Besides diving, it’s also great for snorkelling, sunbathing and kayaking. It is home to around 20 dive sites over coral reefs and good macro life as well as tropical fish life. It is also a duty-free island! One thing to note that is has only ONE ATM machine in Tekek but it does not accept all cards. Deemed as one of the best islands to do a diving course for beginners, it has calm waters and great marine life with pretty corals! 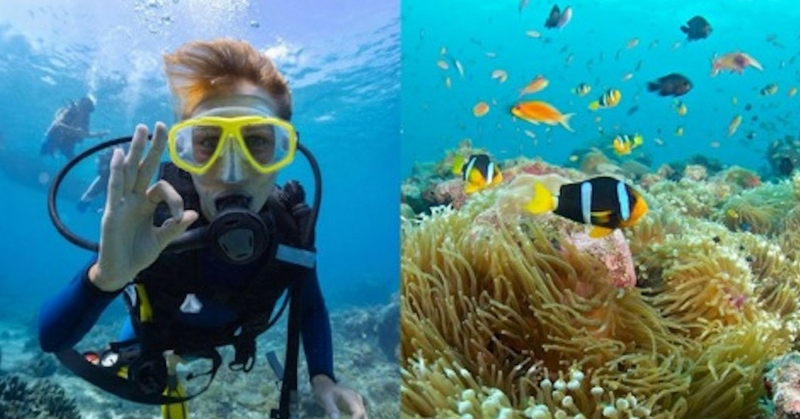 It is located in Terengganu Marine Park and the sites offer great snorkelling as well. With clear turquoise blue sea, turtles, black tip reef sharks and stingrays can be seen here. Some things to note are the islands are closed during monsoon season (November through to February). Located right opposite of Kota Kinabalu, it is home to five islands – Sapi, Mamutik, Gaya, Manukan and Sulug. Coral reefs can be found in all the islands and an abundance of marine & macro life like Seahorses, Orangutan Crabs and Clown Fishes as well! Located north of Sandakan, Sabah, it is a small island that is home to coral reefs, macro life and small wreck sites! It’s also quite a secret among divers as it is less visited due to the island’s location in the Sulu Sea. Cuttlefish, ghost pipefish, frogfishes and octopus are among the few that can be found here! There is also an artificial reef called the Jetty Wreck. March to May are a great time to go if you would like to experience whale shark sightings! Great for muck diving, it is located within the Tun Sakaran Marine Park, Sibuan and it is considered one of the most spellbinding dive locations in the country! Sandy bottom, calm and clear waters with great marine and macro life, it makes it great for beginners. Seahorses, hammerhead nudibrances, cloudy moray eels and more can be found here. Let us know how your diving experiences went!